Is a challenge we face everyday as we decorate our homes on a budget. This group of talented bloggers take thrifting to a new level. 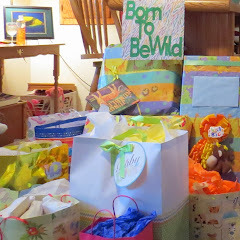 Dragonfly & Lily Pads has decided to join them to bring you a wealth of information to use in your home. 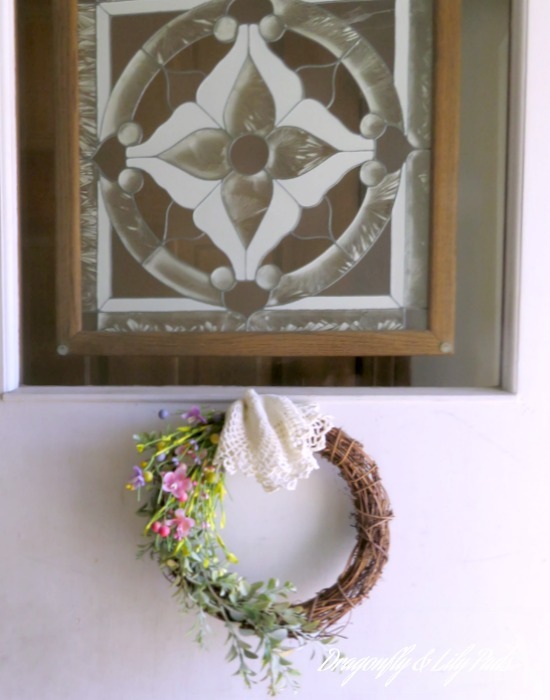 Today I am sharing a wreath that I bought a few months back for Fifty cents. 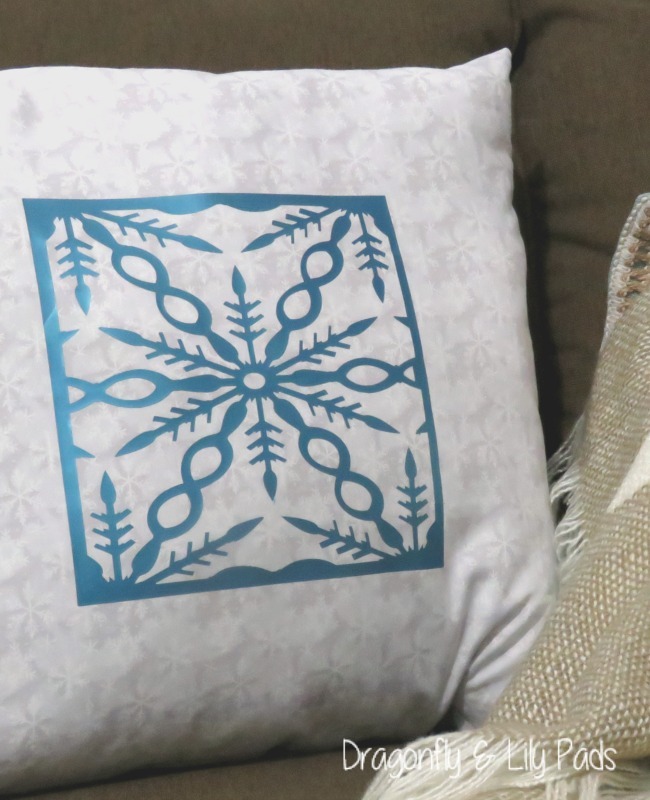 Learn how to make yours below along with Twenty Nine more thrifty decor items. This wreath was Fifty cents at a local thrift store which support several elementary schools in my area. It was all the rage but not any more. Lets see what I can do to update it for the spring season. Shop in Your House. Gather your supplies. I alway have a a bit extra for options if possible. Begin arranging the green stems to fill in and curve gently. I always do a trail arrangement to make sure I have enough and like the design. 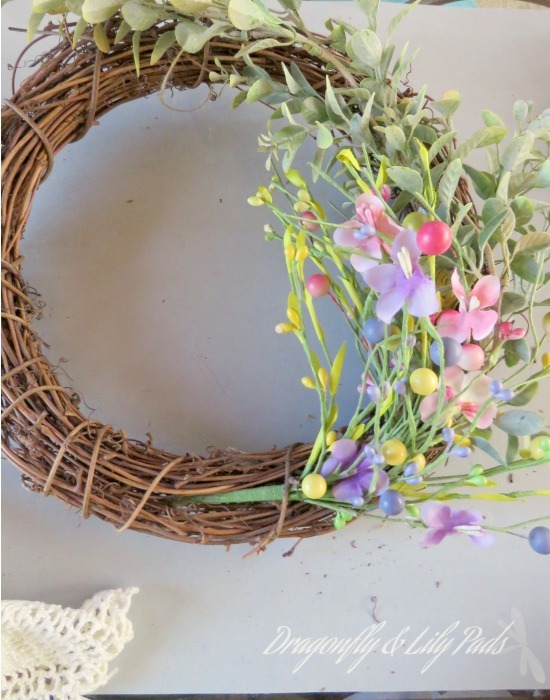 Add the flowers while tweaking the placement of where the flowers land in the wreath. 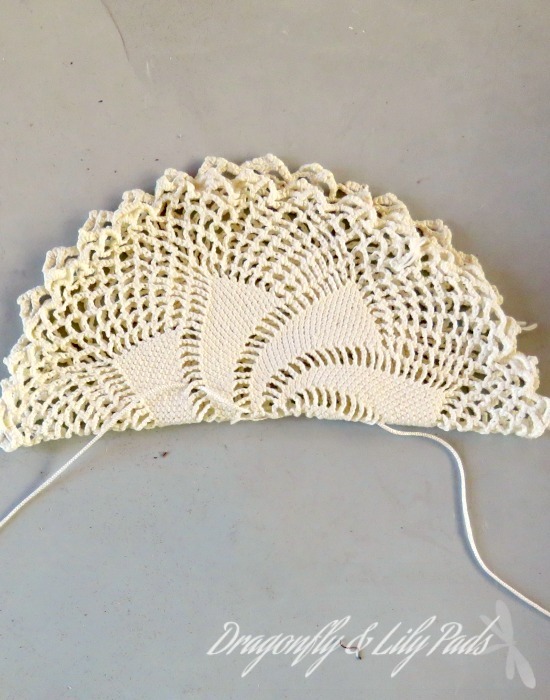 Thread ribbon cord through the openings in the doily. You do not need a needle for this step. 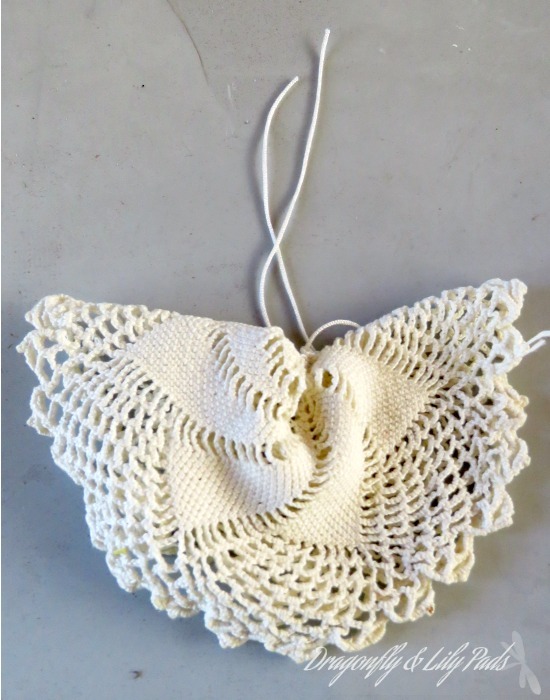 Pull the cord slipping the doily through to create a gather and tie a knot. 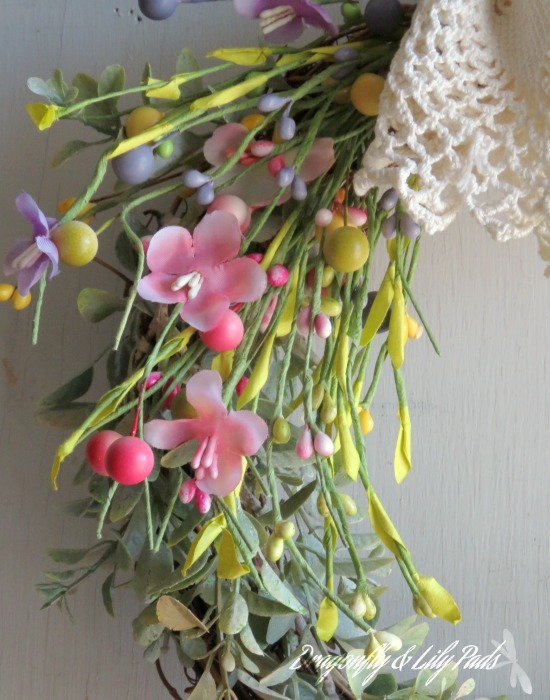 Choose a place pleasing to your eye to tie tightly to the wreath. 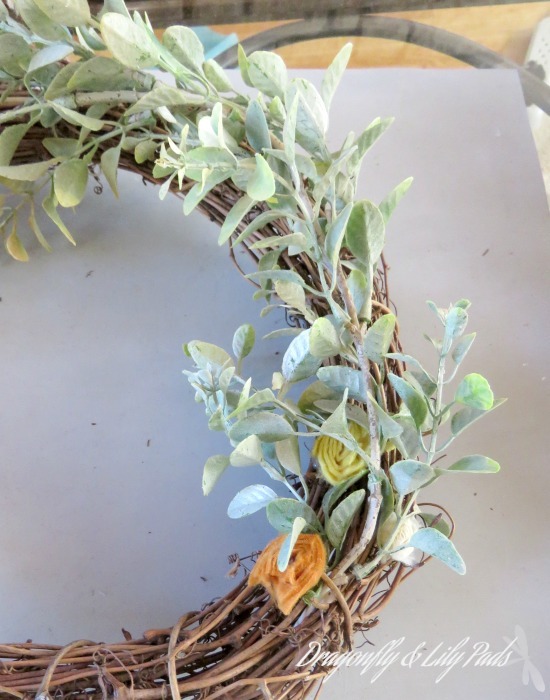 This should cover your stems and give you a loop to hang the wreath. This is the original front door to our late 1930's cape cod style home. I added the stained glass to provide privacy but let in light. Our door needs a fresh coat of paint. Please focus on the lovely wreath today. The doily was just given to me recently when my aunt passed away from her son. It looks sweet in place of a bow for a different styling. 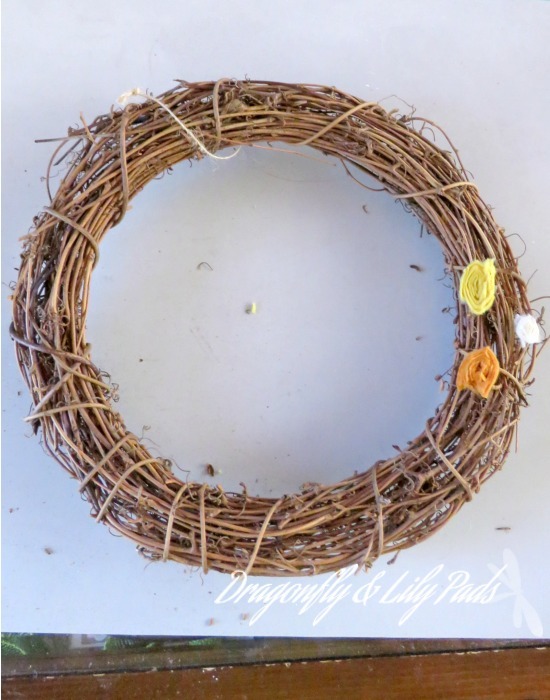 What other items have you used to finish off a wreath? 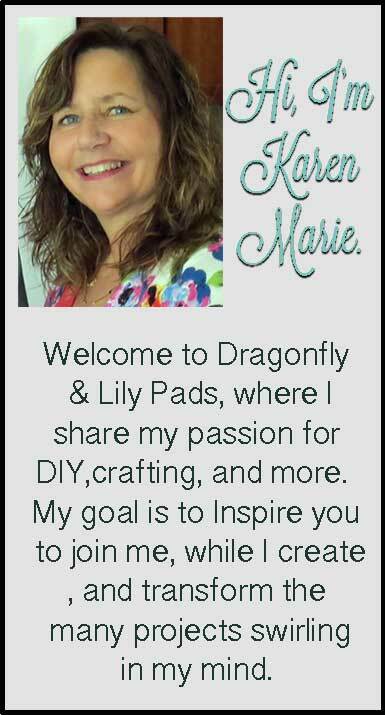 Stop by Dragonfly & Lily Pads Facebook and leave a comment of photo of a wreath you have made. The remainder of the materials were in my house. As with most thrifty souls there is plenty more where that came from. 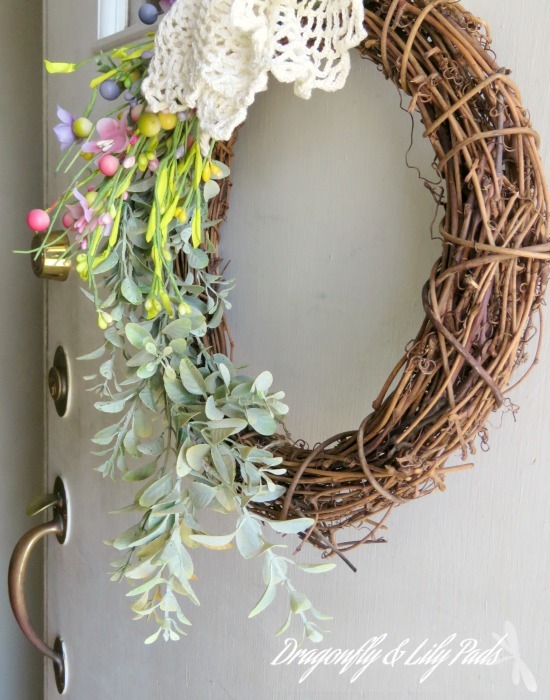 The wreath is a fresh with welcoming burst of colors to greet my guest for spring. Not bad for a fifty cent investment plus fun creative time. 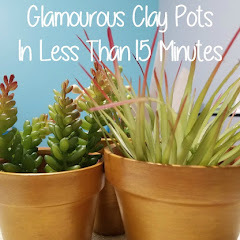 Did you notice I did not mention glue or tape in this tutorial? 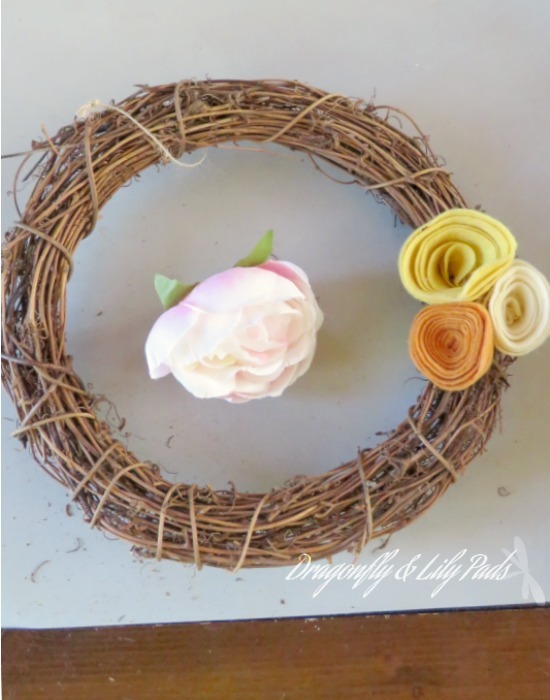 You are welcome to use them both but I chose not to so I could reuse all the materials in the wreath. The have greens have already made an appearance on D&LP. Silly I know but none the less I have made a pinnable Before and After for you below. Get your Pinterest button clicking! You will want to have these projects and ideas on your idea boards available to you at any time. Your time is precious and I am honored to share your day. Please follow along with social media for behind the scenes on D&LP. I would love to learn more about you. Comments are always welcome and encouraged. What is your favorite flower in the Spring? This is so pretty and i LOVE how you incorporated the dollle! That's a great find for 50 cents! Covering the felt flowers with some new spring flowers was a great idea. I love how your pretty wreath turned out. The vines and spring colours you chose are perfect. Love it. Fifty cents for that wreath is a great deal, and you did a wonderful job with it. Love the lace and the flowers. Karen, this wreath is so pretty! Love the addition of the doily! This is so sweet, and the doily is a beautiful touch! Love this! I always look for wreath frames at the thrift store. The flowers you used are so cheery. Karen, you took that sad wreath and breathed some beautiful Spring life into it. I love what you did with the doily. I have so many of those from my great grandmother so this gives me a good idea what to use them for. The lace is PERFECT. Pinning and sharing. Oh my goodness! 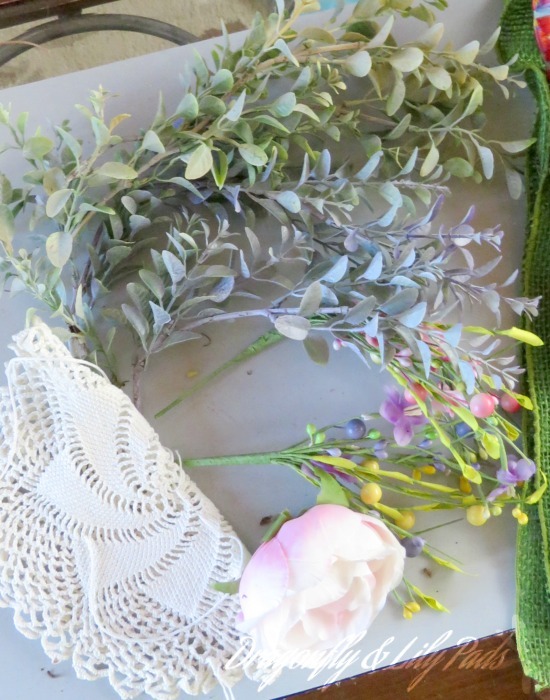 I've got all the pieces to make my own spring wreath. 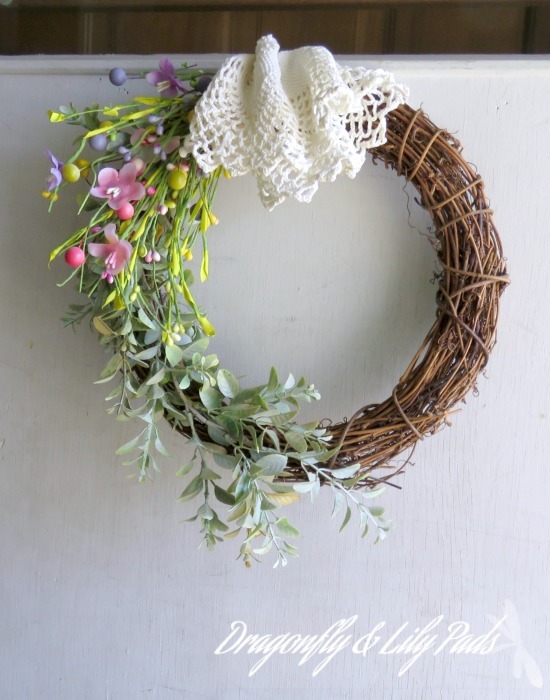 This is such a pretty wreath and I really like the addition of the doily instead of a bow! I love your wreath. I am so bad at arranging flowers but you make it seem so easy! I love the little doily too! It finishes it off nicely! What a delicate and sweet wreath. I always think of Spring in pastel colors and pretty flowers. You got it. Love this! Super cute! I am ready for spring in Mass. Maybe I should get out my lavender wreath. Thank you so much for your sweet comment. It is just playing with the pieces until you like what you see.